Who couldn’t use more chocolate in their lives? January’s chilly days call for a little baking—while I’ve told you that I’m already excited to try the bread and cinnamon rolls from Bake from Scratch, I also couldn’t resist sharing a tried-and-true favorite with you. The latest issue of Bake from Scratch has a variety of winter baking delights. They’ve included recipes for breakfast muffins, rye bread, and Turkish pastries. They also have a delicious collection of chocolate recipes. Hand pies, éclairs, pots de crème—all flavored with delicious chocolate—were included in the feature. Who could resist? As you know, Bake from Scratch has added several new recipes to my baking to-do list. 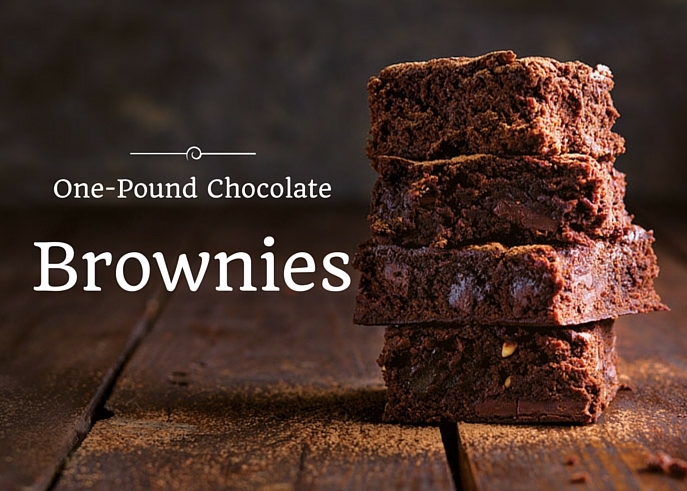 For a fresh take a classic, I wanted to share their One-Pound Chocolate Brownies with you. Makes 16 servings Rich, dense, and packed with chocolate, these are not your grandma’s brownies. The orange marmalade adds depth and keeps the brownies moist. 1. Preheat oven to 350˚. Line a 13x9-inch baking pan with parchment paper. Lightly grease parchment. 2. In the top of a double boiler, add chocolate and butter. Cook over simmering water, stirring occasionally, until mixture is smooth. Remove from heat. Stir in orange marmalade and half-and-half. 3. In a large bowl, whisk together sugar, flour, cocoa, and baking powder. Stir in melted chocolate mixture, eggs, and vanilla until moistened. Stir in chopped chocolate. Spread batter into prepared pan. Bake until brownies are beginning to loosen around the edges, about 30 minutes. Let cool completely in pan before cutting. For a unique addition to your brownies, their baking experts offered a few different specialty additions. I thought their Raspberry Brownies sounded especially tasty. They would be perfect for a Valentine’s Day treat next month. What do you love to bake on cold winter days? Okay I thought to myself as I was making these brownies today…are you sure there is no eggs!!! I got the recipe out of the BAKE magazine. After searching for a few minutes I came across your website and low and behold…EGGS 4 EGGS…now it makes sense why my Brownies resemble greasy dirt. Thank you June…will give it a try. Where I’am in Florida our cold spans are not too long, but when we do get them I like to make bread pudding! The cinnamon that I sprinkle on top makes the whole house smell wonderful! Happy baking and enjoy! I am wondering if I could add to the cocoa powder ? Yimmmmm!! You are determined to make a “baker” out of me! My husband and family…. Thank you. I say…. Better see how I do before you make any rash statements…. All kidding aside, thanks again for your wonderful blog! Yum!! Could I bake these as cupcakes using cupcake liners? I thought it would be nice for Valentine’s Day using decorative liners. I have made mini brownies using muffin pans and liners. You have to watch them very closely. If you make full size cupcakes, I would start checking them at 20 minutes and see how they are doing. I would love to know if it works. I LOVE baking and brownies are one of my specialties. A fav request from family and friends.